Bob's Bowling Bonanza Video Slot Review - Casino Answers! Bob’s Bowling Bonanza is a 5-reel, 30-line video slot developed by Microgaming, featuring a wild symbol, scatter wins, a gamble feature and a bonus game. You can play the Bob’s Bowling Bonanza video slot at Bovada. The Bob’s Bowling Bonanza casino game is a penny slot. Bets on the Bob’s Bowling Bonanza slot machine are $0.01, $0.02, $0.05, $0.10, $0.20 and $0.25. You can select 1-30 paylines at 1-10 coins per spin. The maximum total bet on the Bob’s Bowling Bonanza video slot is $75 per spin. This is a decent betting range that will suit most online slots players. 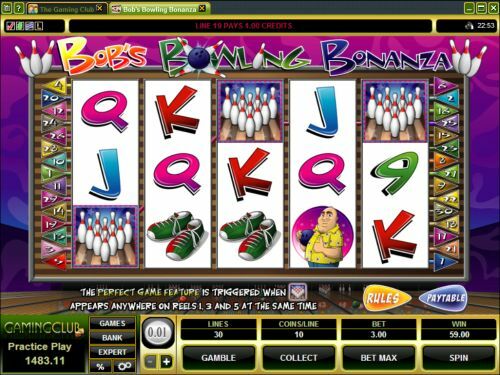 To play the Bob’s Bowling Bonanza online slot, select your bet and press the “Spin” or “Bet Max” button. Bob is the top-paying symbol on the Bob’s Bowling Bonanza slot game. If you hit 5 Bob symbols on a selected payline, you will win the 5000 coin top jackpot. Other high paying symbols include the Girlfriend (3000 coins) and Trophy (1000 coins). You can win big from the Bob’s Bowling Bonanza top jackpots when you play at Bovada. The scatter symbol is the Bowling Ball symbol. You can get a scatter win of as much as 100X your total bet by hitting as few as two scatter symbols. After you get a win on Bob’s Bowling Bonanza, you can click the “Gamble” feature to start the gamble feature. In the gamble feature, you can double your win or quadruple your win. Choose the correct card colour and double your win. Choose the correct card suit and you will quadruple your win. Press the “Collect” button to exit the gamble feature on Bob’s Bowling Bonanza. Pays are made according to the Paytable. Payline wins are multiplied by the bet per line. Scatter wins are multiplied by the total bet. Scatter wins are added to payline wins. All symbols pay left to right, except for the Scattered Bowling Ball symbol (which pays any). Highest win only on each selected payline. Coinciding wins on different selected paylines are added. The Strike symbol will substitute for all otehr symbols, except for the Scattered Bowling Ball symbol. Bob’s Bowling Bonanza has an autoplay feature with advanced settings. To use the autoplay mode on the Bob’s Bowling Bonanza online slot machine, you must hit the “Expert” button. You can now play 5 or 10 autoplay spins. For advanced settings, hit the “AutoPlay” button and you can now play 5, 10, 25, 50, 100, 250 or 500 autoplay spins and stop autoplay if a win exceeds or equals $100, $500, $1000, $5000 or $9999. Autoplay will stop on any feature contained in the game. You can stop autoplay at any time on the Bob’s Bowling Bonanza slot game. Microgaming has a lot of slots – some good, others not as much so. However, the newer ones like Bob’s Bowling Bonanza are all fantastic. Bob’s Bowling Bonanza in particular looks fantastic with some nice sound effects, sweet payouts and a fun bonus game. You don’t even need to like bowling all that much. It’s an enjoyable video slot that you can play at Microgaming online casinos such as Bovada. Can players from the United States play Bob’s Bowling Bonanza for real money? No, American players cannot play the Bob’s Bowling Bonanza slot machine for real money at this time. Rather, you can play the excellent Rival iSlot called Bowled Over at Bovada. Is there a Bob’s Bowling Bonanza flash game that I can play instantly for free? 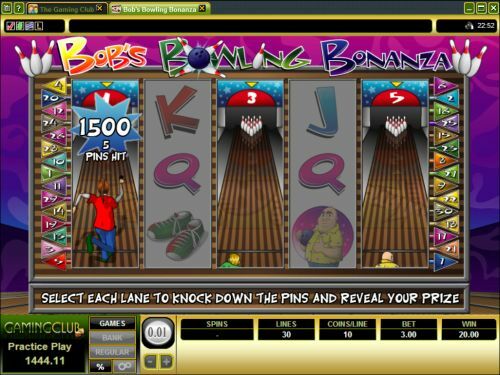 Yes, you can play the Bob’s Bowling Bonanza flash game at Microgaming flash casinos such as Bovada. You can play for free or for real money. If you have any issues with the flash software, you can download the newest edition of Adobe Flash Player. Where can I play more bowling-themed online slots? For a list of all of the different bowling-themed slot machines available at online casinos, please read our complete list of all sports slots.